The thermometer sits at 13F (-10C) this morning and the low for tonight is forecast to be 7F(-14C). Of course it’s much warmer on this side of the windowpane, and even if I took off my cozy sweatshirt I’d still be comfortable so I guess there’s plenty of reasons to be thankful. Even last weekend’s snowfall was just a minor inconvenience, although it came as a surprise and the fall decorations look a little out of place now. Admiring the mums one week, shoveling snow the next. So much for gardening! The snowdrop walk next to the unshoveled driveway. If you look closely you’ll notice the neighbors have cleared driveways and walks. This year the kids discovered that other people will give them money in exchange for snow shoveling, unlike their father who thinks he should get an ‘all those times I took you to the Chinese buffet’ discount. For those of you celebrating Thanksgiving today I wish you all the best for a wonderful day. In spite of all the complaining about weather and time, pests and circumstance, I realized I’ve been blessed with more than I deserve. Fire, famine, war and walls are in the news each morning and today I’m Thankful my biggest complaint is the temperature. 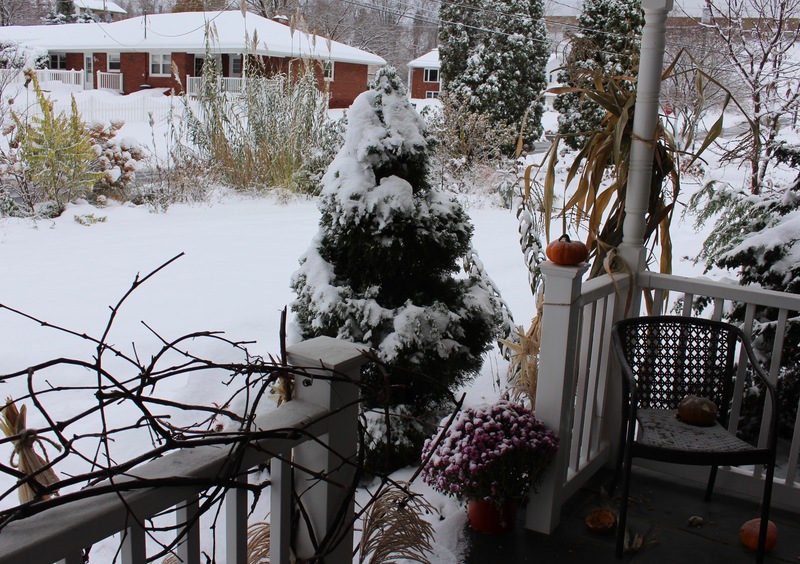 This entry was posted in early winter, snow, Uncategorized and tagged gardening in pennsylvania, snow, thanksgiving. Happy Thanksgiving, Frank! In spite of the chill and the early snow, we really are blessed! Nothing lovelier than snow on evergreens and bare branches. We only got a tiny bit of snow last weekend but it was supposed to warm up so we didn’t clear the driveway. Still snow-covered as it is on the north side of the house and all those south side drives across the street are bare. Have a lovely warm day indoors. I hope by now your snow is gone. It’s far to early in the winter to worry about an icy driveway for days on end, that only belongs in January. It’s been rather mild but yesterday the low here was down to 6F. I hope it’s not a repeat of last year when the quick onset seemed to damage tender growth and harm the evergreens… only time will tell, but at least this fall the leaves didn’t all freeze dry onto the maples before they had a chance to drop! There is always something exciting about the first snowstorm, don’t you think? It’s put me in the holiday mood, at least until the next rainstorm on Saturday. Happy Thanksgiving to you Eliza. The snow really is fun to see when you’re able to enjoy it, and luckily we could. The change in the landscape is always such a surprise when all the debris of the last season is covered and smoothed over and the tree branches are full with white. I love looking at it, I just need to find myself a warmer coat! Happy Thanksgiving Frank. You are going to have to think of something more to bribe your children to shovel snow for you. ha… The snow looks beautiful in your garden. Sit back and enjoy it while you can. Have another piece of pie. I know! I found out my wife bribed them to shovel the walk, but then when time came to pay up she directed them to me. I played dumb though, and trust me I do it well! Have a blessed Thanksgiving for you and your family…and the critters too. I have enjoyed your reporting over the past years and for that I am grateful. Thanks John, and the same for you. I’ve enjoyed your writing over the years as well and wish you all the best for your next adventure. Happy Thanksgiving! I’m so glad you have “cleaning playrooms and painting bedrooms and moving furniture” to keep you occupied inside. I’d hate to think you had nothing to do but “stuck on a couch and eating and drinking all day.” Perhaps you’ll get a thaw and actually see that snowdrop of yours bloom. The snowdrops don’t look too bad, considering they’re nearly in bloom yet frozen solid under their cover. My fingers are crossed! Wow, so much snow already! But I suppose it IS nearly December. It crept up on me… Hope you had a good Thanksgiving and have great weekend! Same to you Cathy! December may be creeping in but snow really comes in handy as far as getting Christmas thoughts going and giving you the push to get started with all those little holiday preps. Also the break from lawnmowing is a relief… although I don’t appreciate going straight to snowshoveling! 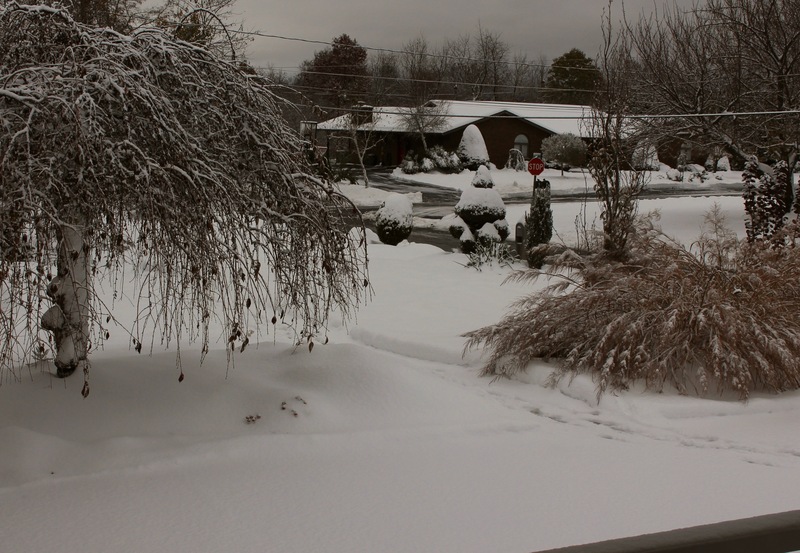 The snow looks much better in your yard than in mine. We had a nice sunny week for the most part. It misted yesterday and is sunny again today Sunday is going to be a different story… The forecast says, “Breezy. Rain likely before noon and snow likely in the afternoon. ” The wind is going to pick up to 20-25 MPH by morning… We are only supposed to have maybe 1/2″ accumulation but the week will be much cooler than this past week. Seems like so much of the country was covered with snow. I feel like we were granted some special exemption. Hope your family and a fun Thanksgiving. Amen to that! Though in my case it’s too high a temperature, rather than the other end of the thermometer. Hope you had a beautiful Thanksgiving. The snow is so beautiful especially the first snow of the season. Enjoy the indoor jobs foe a while it will soon be snowdrop time!